If you don’t want to eat this bread, I’m going to have to check your pulse. I wrote the sentences for this piece in my head, long before today. However, they have all disappeared in a haze of too-much coffee, too-little sleep, notes scrawled in orange marker, and a darling toddler interrupting it all (thank goodness). For the record, we’re beaming. We really love our book. We think you will too. However, the sentences I sang for days, celebrating the fact I could show you this bread? They’ve all disappeared. And you are probably thinking: Shauna, that’s okay. Just tell me how to make this bread. This bread recipe comes from Healthy Bread in Five Minutes a Day , the wonderful new book from Jeff Hertzberg and Zoë Francois. Don’t know their names? You know their other book, I’m sure: Artisan Bread in Five Minutes a Day . Almost everyone I know who can eat gluten makes bread out of that book. They all rave. The rest of us were left to feel sad, shunted off to the side again. Jeff and Zoë are professionals, bakers who understand bread. And they gave their attention to us gluten-free folks. That’s right. Gluten-free olive oil bread. Gluten-free pizza. Gluten-free sesame baguette. Gluten-free cheddar and sesame bread. Crackers. Bread sticks. And brioche. Plus, with the brioche recipe, you can make most of the pastries in the last chapter. That means apple strudel bread, doughnuts, sticky buns, cinnamon crescent rolls, and fruit-filled pinwheels. Do you need me to write anything at all before you buy this book? Oh, just this. They’re good. May I direct your attention to the photo on top of this post again? That’s the gluten-free boule from the book. Exactly as written. It makes a lovely sandwich bread too. And we made gluten-free naan the other day, with our friends Matt and Danika, and we all loved the way they puffed up and tasted. Really, do you need more? Does the fact that you can bake this bread as an enormous rosemary-kalamata olive loaf persuade you at all? Look deep into the space between the two halves of the crust (I cut my pre-baking slices too deep. Normally, you don’t get a crevasse like that). See those elastic strands, pulling as though in slow motion? Those look like gluten strands in bread. Yep. This bread tastes like the real thing too. See that crumb? Do you want a bite? You can have one, soon. The recipe is right below this next photo. Now, normally, I don’t publish a recipe as it’s written in a book, or even close to it. Danny and I both respect and adore the people who work hard to create cookbooks. We think you should buy the cookbook itself to get the best recipes. But here, we’ll make an exception. You see, Jeff and Zoë already have the recipe published on their website, so we don’t think they’ll mind. Besides, there are at least a dozen other gluten-free recipes in the book that you will want to make. Giving you this one won’t ruin your purchase. And finally, we actually helped Jeff and Zoë develop this bread. We were honored to test their original recipe for them. We were nervous about telling them it wasn’t very good. We were happy to offer a dozen suggestions about flours and techniques to make the recipe great. And we are thrilled with the final bread. So, since we had a hand in this recipe, we think it’s fitting to offer it to you here. Bread, people. It’s real bread. And, we’re giving away a free copy of Healthy Bread in Five Minutes a Day to one commenter on this post. Just tell us something you have learned about gluten-free baking through your experiences. I know we can all learn from each other. I loved the rosemary loaf made by Essential Bakery in Seattle. My dear friend Gabe and I both loved it so much we used to leave it in each other’s mailboxes as a present when the other was having a bad day. 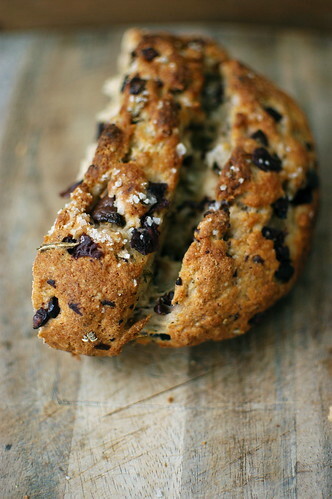 And I seemed to live on the olive loaf from Macrina Bakery in Seattle, just before I found out I had celiac. I’ve missed both those breads. So I put them together and made this. Mixing the flours. Mix together the brown rice flour, sorghum flour, tapioca flour, yeast, salt, and xanthan gum in the bowl of your stand mixer (or a large bowl, if you are doing this by hand). Making the dough. Add the water, eggs, oil, and honey to the dry ingredients. Mix with the paddle attachment (or with a large spoon if you are mixing by hand) for a few moments until the dough has fully come together. It will be soft. It will sort of slump off the paddle. Don’t worry. That’s the right texture. Add the olives and rosemary and mix one more time. Letting the dough rise. Put the dough in a large, clean bowl and cover it with a clean towel. Put the dough in a warm place in your kitchen, then leave it alone to rise about 2 hours. You can now use the dough. Or, you can refrigerate it in a large container with a lid. The dough stays good for a week. Refrigeration overnight does seem to improve the flavor, as well. Half an hour before you will put the bread into the oven to bake, turn on the oven to 450°. Before baking, make 1/4-inch-deep cuts with a serrated knife to the top of the dough. Pour on a bit of olive oil and sprinkle with coarse sea salt. You can put a large sauté pan filled with ice cubes on the rack below the one that holds the baking bread. This will create steam in the oven and help to form that golden crust. 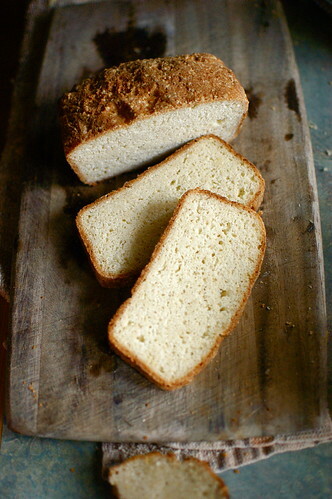 Aran over on Canelle et Vanille posted the gf brioche a few months back. It's just fantastic!!! Freezes well also and, as you said, is perfect to adapt into other pastry recipes. For me, the journey into and through gluten free baking has been about setting aside my attempts to recreate what we could eat before. Once I started to respect the ingredients for what they could bring, rather than how close to the "real thing" they could get me, my baking improved. Once I realised that gluten free flours make the best biscuits because they end up wonderfully short, and that sponge cakes are the lightest, softest you've ever tasted – as the flours are so light – then I "got it". People eat cakes at my house and rave – and then are amazed that they are gf. Even bread – if you rid your mind of that white, medium sliced, extra soft, processed, packaged supermarket bread that you used to eat and instead focus on different ways to create flavour, texture and smell – can be enjoyable. Beautiful! I love the picture at the top of the post. And no, you don't have to check my pulse because I *definitely* want to eat that bread! wow that recipe looks awesome! My gluten free baking tip: if using pre mixed gf self raising flour, multiply the quantity required by 1.06125 (i.e. add 1/8th cup extra per 2 cups). When using plain pre mixed gf flour, leave the quantities the same. hhhmmm… it's been 20 years or so since my last failed bread making attempt. You may have just persuaded me to take another stab at it…(no pun intended). One thing I've learned about gluten-free baking is that I need a lot more counter space, time, and money for the flour than I currently have… though in certain cases I might be willing to make exceptions! 😉 My gluten intolerance is not severe, and my incredibly limited budget has me dealing with symptoms of blisters and fuzzy-headedness until I can afford to go completely gluten free again… which I am surprisingly looking forward to again, even after "getting to eat" all the foods I missed during the year and a half of being 100% GF instead of partially. I attempted my first yeast-based gluten-free bread over the weekend and was pleasantly surprised by the outcome. We all know that the gluten in wheat flour is what helps give bread it's characteristics, but on the other hand, I realise now first-hand that the alchemy and biology of baking dictates that if you give the yeast something to feed on, they're going to do the work of making something lighter. And they did – with potato flour and rice flour no less! Thanks for this recipe – it looks awesome and will be on my weekend baking list. What I've learned is that it just keeps getting better! I was diagnosed 40 years ago at the age of 8 months, thanks to a fantastic gastro specialist at Sick Children's Hospital in Toronto, and I have navigated the early days of rice flour everything, which tends to turn best laid plans into pans of tasty crumbs – but crumbs nonetheless. My mother was a saint in the 70's, tirelessly trying again, this time with corn starch, then mashed potatoes, more applesauce, maybe some mayo – going to Mother's Pizza and McDonalds with pancakes in hand to "please make a pizza / burger with this". Our favourite appliance was the freezer, since the efforts involved relied upon bulk production. What I have learned as a celiac is that I LOVE baking, and it has forced me to embrace the creative sport with a passion – I WANT to taste that thing that I have NEVER been able to try (eg. cinnamon buns, crusty boule – thank you thank you), and i will now find a way to do this. I have learned also of the community that bubbles out of shared deprivation, and shared opportunity for creativity – through my own interactions over the years with other celiacs, and through your very own website. It's a family unto itself, this community – full of inspiration and rooted in the fundamentals of what makes us human – the sharing of our secrets, of our favourite tastes and tricks, our struggles to live as fully as we can in our time. That is what I've learned in my world of baking as a Celiac – that it just keeps getting better because we keep patiently opening new doors together, and marveling at the view. I have heard this book recommendation through many sources now, and it is destined to find its way to my shelf one way or another – thanks for the enticement through your recipe, and for all you do on our behalfs in this cozy community of ours. I am not a gluten-free cook, but I have friends who are. I have learned an awful lot from this blog, and I refer people to it quite a bit. It's an excellent resource. It looks wonderful! The bread, I mean. What have I learned about gluten free baking? There are a lot of failures in the beginning, but once you get the hang of it, it opens up a whole new baking arena. When there are so many different types of flour, you get to experiment forever! Oh my! This looks heavenly. Then other night I made Croque Monsieur for dinner and I couldn't have it. I thought – there has got to be a way to have this gluten-free! Now, I think I have found it! So excited to make this!! Thanks for a good-looking bread recipe that will taste good! i've learned a lot about gluten free baking over the last few of years. but most importantly i've learned to experiment. i write down adjustments i make, the different flours i substitute and just bake. sometimes the bread comes out great, sometimes it's just ok. but it's all bread that my gf husband can eat and it's all more yummy than store bought. it's great to read your blog and see how you experiment and learn. One thing I've learned…well I hope others will be more helpful than I…I've learned that gf baking is hard and more often than not I create something that's hard as a hockey puck, or won't stay together at all. I love your blog..and I neeeeed this book…visions of pizza crust and doughnuts dance in my head! What have I learned in gluten free baking? I have learned that potato flour and potato starch are NOT the same thing. I have learned to be humble as not everything works out the first time. I have learned that you can recapture that moment of your youth when mom was making cinnamon buns on Christmas morning and you thought you would just die from wanting to eat them while they were cooking. I have learned that a kitchen covered in a dozen types of flour and two friend covered in dough eating a fabulous new gluten free, sulfate free creation is worth more than anything in the whole wide world. Thank you for your blog, I have been a reader for years now and you never fail to inspire me to try something new. I made their GF crusty boule last weekend and absolutely loved it! Even my gluten-eating friends raved about it. I can't wait to try the other recipes in their book to tide me over until fall. I very recently discovered I have a gluten intolerance. Really, I thought everyone just felt full, bloated, cloudy in the head, and tired all the time after eating. What a difference this discovery has made in my life. You are an inspiration. I just love your writing style, and simply drool over your fabulously scrumptious photos. You and your family are truly an inspiration to me as I begin my gluten-free journey. Thank you…I think I am going to be sticking around your blog for a bit! I've never tried to bake a loaf of bread in the 5 1/2 years I've been gluten-free, but I'm going to try this today! All I need is the rosemary … I can't wait. Looks tasty. I know how hard working without Gluten can be! More than what I have learned about cooking, I have learned about life. Use quality and have patience. I have only recently gone gluten-free for health reasons (although I'm not celiac). I am the farthest thing from a baker, but one thing I do is make Challah every Friday for our Sabbath table. Boy do I miss eating it!!! I'm looking forward to trying to adapt your recipes and figuring out the best gluten-free Challah. I only recently found your blog, and I love it! I feel like I have virtual support. Every time I feel like giving in to my Challah cravings, I go to your blog and remember why I'm doing this. Thanks. You guys ROCK! Oh my, Shauna. This is on my weekend to-do list, for sure! I've learned so much about GF baking, and mostly from you. And the best thing – that I can have gluten-free homemade treats that are BETTER than the original. Such a gift. Thank you…and I'm going to Amazon right now to buy the book! It looks really beautiful! My mom and I baked your cinnamon rolls over Christmas holiday, and it was such a magical experience – she had baked special cinnamon rolls for everyone for years, but in 2001 I was diagnosed with CD, and then last year she was, so no more of them. But your recipe brought them back for us, and it was perfect. I have learned how effective baking by weight is. I was so excited when the cinnamon rolls came out of the oven on Christmas morning. They were amazing. The GF breads are getting better and better all the time thanks to committed cooks, such as you, Danny, Jeff, and Zoe. Thank you, thank you, and thank you again for all that work. I like to cook and create new things in the kitchen, but I find it to be torture to write down along the way. The work you put into creating cookbooks is absolutely amazing. I Like the idea of ice cubes in the oven to create steam. I have never read that anywhere before. Is that YOUR innovation? A lot of non-GF cooks can learn from that. BTW, I was watching TV the other day, and I can't recall the name of the chef. However, he said something along the lines….."it's about finding the food that loves you back." I was thinking, "Helloooooooooo, didn't that expression come from Shauna Ahern's book?" You are not a great gluten-free cook. You ARE a great cook, as well as a great writer. Yum! That looks delicious. The best thing I have learned recently about gluten free baking is almond flour! I'm trying it in a bunch of things I could never get quite right before, and it's helping. Thanks! OMG. Seriously. I'll be making this today. I've learned that gf living isn't living without, it's just a new opportunity to bake. I tried my hand at gf nutmeg doughnuts last night, and wow–I'm so glad I did. It's so nice to know that we need not rely on 'acceptable' substitutes–there are delicious gf recipes for anything we might yearn. I did make GF tortillas the other day (no corn) and they were so delicious. Even though this was small (i did bake them) it made me realize how easy baking GF can be. It isn't this insurmountable activity anymore! Thanks for blog, it has been a crash course in GF baking for me, and inspired me to get working on making my own breads. That bread looks absolutely wonderful. I can't share anything I've learned about GF baking, because (other than things that are flourless, etc…) I've never done any! I am increasingly intrigued by it, however, and would really like to experiment. Especially when I see things like your lovely breads. wow. yummy. been a long time since i baked bread – might need to give it another go. That is just craziness, it looks so good. This bread will be making an appearance in my house tonight, and I'm sure it will be a very short one. It's going to get gobbled up all too quickly. One thing I've learned about gluten-free baking is that good gluten recipes can be converted successfully, but it takes several tries to get it right. I find that usually more liquids are needed. More eggs, more butter. To make things lighter, and to hold everything together. I've also learned how absolutely crucial it is NOT to accidentally forget xanthan or guar gum. If people think it's some gimmicky additive, just try making a batch of cookies without it and you'll see that you have just made cookies that are simultaneously a pile of goo and crumbly. Oh … something to do this weekend! I tried the Babycakes Tea Cake recipe last week, and the results were horrifying. So fingers crossed for this! I'm shakin' in my boots with excitement about this recipe. I have been obsessed with baking bread in a dutch oven ever since the infamous no-knead bread article in the NYT came out years back. I am newly gluten-free and have been hoping for a bread recipe that uses this method; it's a dream come true, really. I work as a baker/pastry chef/cook and learning I was gluten-free turned my world upside down a bit. My gluten free tip? Make gluten free baking fun by embracing gluten-free baking as a new challenge. Cooking with limitations is, I think, actually more exciting because it takes some backbone, dedication, and willingness to fail. When something turns out, and you are able to exceed your own and others expectations, it's all the more gratifying and tastes just that much better. This looks so fantastic, I'm going to have to hunt down this cookbook. I think the main thing I've learned cooking GF is that even the failures aren't failures. They're a way to learn how the different flours work together. I love that GF baking is a challenge and I know more about different ingredients and techniques than I did with gluten filled baking. OMG, these loaves are so gorgeous and yummy looking! I attempted GF bread only once, using a bread machine (very carefully cleaned) that a friend passed on to me. The result was a perfect texture, but there was some funny, acidic sour taste that turned me off, and I never got around to more experimenting. This recipe is inspiring me to give GF bread a try again. Thank you Shauna for spreading the news about this recipe, and this book. I have just discovered your blog and went and have started reading from the begining. I've been crying. I understood your story and I've been living my own. Finally, last September I was diagnosed and have only been gluten-free for these past few months. I have wings. I would love this cookbook but mostly I wanted to say thank you. THANK YOU. THANK YOU. I've learned that a stand mixer and plastic wrap are life savers! I have to say that I have been intimidated by the Gluten Free baking. It's not that I don't like to bake, I did before I was diagnosed. I think the thing that has been stopping me is all the little bags of flour and the precision with which you must bake. The one thing that I have learned from making GF goods is that they are never 'exactly' the same as the old gluten standby. I hope to start baking more so that I can tell how all the GF stuff is different. This olive loaf might be enough to throw me in the deep end of GF baking. I just got that book from the library!! I haven't opened it yet, but I will now 😉 I have learned primarily not to settle! I heard people saying, "oh you'll need to get used to the 'off' taste of baked goods and never having bread again", but thankfully they were wrong! I've recently had some wonderful gluten-free and dairy-free bread, and I make some pretty amazing cupcakes and cookies. I think I'll need to purchase this cookbook to tide me over until yours is available! the only thing I have learned from GF baking is that it requires time and patience. And the willingness to throw a few things in the compost until you get things right! I have not been baking GF for very long, but I've learned that it may take many attempts and experimenting before I can get a GF recipe to work. And then when it finally works, it's more rewarding. I haven't attempted to make any yeast breads yet. I've been balancing the switch to gluten-free baking, along with baking at high altitude, both of which present their own challenges. I've had more disappointments with my current attempts than any other point in my life, but I've learned to take notes and try again. Thank you so much for this bread recipe! I'm moving to a new house this week. This may be the last thing I'll bake here, or the first thing cooked in the new place! GF bread baking has taught me one thing I usually have a severe shortage of…patience. I'm not the type to relax, follow instructions, and breathe. I at least have to some of the time while cooking gluten free. Hi Shauna! This looks awesome. I've learned that potato flour takes a little getting used to…oh, and taht you can't just buy it at any old market (duh…). I just sent my boss the link to your site, as she's experimenting with a gf diet and was looking for inspiration. Thanks for all you do! I've learned to take endless notes! I was never a recipe follower until I started baking GF – then I quickly realized that not only do I need a recipie, but I MUST actually follow it at least once and take careful notes of any later changes, otherwise madness and tasty crumbs are the result, instead of whatever yummy concoction I was going for. I've learned that gluten free baking takes risk-taking and the ability to try things and fail. While regular baking has a long history and precedent, those of us baking gluten-free are really breaking ground and forging the path to finding amazing recipes. It's pretty cool I think! After reading through the comments I feel like I shouldn't even comment. What have I learned about gluten free baking? Let's see, there have been many whispered prayers, lots of begging with the dough to "do what the recipe says it should", lots of tears and a 80% failure rate. 🙁 But… I'm not giving up. The bread looks fantastic. I have a shelf of bread books but none have gluten free bread. Thanks everyone! no need to check my pulse. I want the bread! ;-P Will be making it ASAP! Probably the most important thing I've learned, is that I can make just about anything taste good if I try. My kids do not have to be without the good stuff (as my mom accuses me of doing) just because they don't eat wheat. Making a good all purpose flour and keeping it in the freezer means you can make anything with a regular recipe (using all purpose flour). Fluffy cakes are hard but I was never good at them when we did eat wheat so I think it has more to do with me than with the flour! LOL Thanks Shauna, you inspire. I love, love love, your blog! Not only the gluten free recipes, but the glimpse into your island life. Before I stopped eating wheat, about 10 years ago, I was an avid baker. I come from a long line of bakers. So what I have learned is gluten free dough is alot wetter than regular wheat dough. Wet fingers is the key to forming and handling GF dough. And I think GF pizza dough always tastes better after being frozen. I have tried a couple of mixes for pizza dough and have always liked them better after being frozen. Thanks for this posting idea, I always like to hear other peoples tips! There are so many other things I'd rather be doing than cooking/baking. I just hate altering recipes so your suggestion to do things by weight was a real light bulb. I now have a scale. Your blog intrigues me. I may have to add baking to my want to list! Thanks. I learned that gluten-free bread is now my favorite and I prefer it to wheat bread. It doesn't curl up, stretch or act unaccordingly when you use it. It's easier to make! I've not ventured into bread, but I've tried cake and cookies, I tried making graham crackers and the dough was very odd, but the cracker totally delicious. I've also had a gluten free cake at beas of bloomsbury and it was totally delicious, the best cake they do! Almond flour really is a wonderful thing. i've learned w/ gluten free baking- use a digital scale, makes all the difference! Oh. Oh oh oh. -Bread- like that. I'm almost about to cry. I've missed the kneading and -feel- of bread dough so -much- and this…well, this is a small slice of heaven. What I've learned from gluten-free baking? Is to fail, and get up again and try several once mores. I cannot get xanthan gum here and it is heartbreaking sometimes when the effort and work I put into something just doesn't turn out because of the lack of it. But I'm learning. I'm learning that grinding sorghum makes me appreciate it more than ever because we can't buy sorghum flour here, just whole grains that taste just a bit bitter when ground up and occasionally turns what I bake into just as much of a disaster. I've learned to be creative, and I've learned that you -really- need a sense of humour to call the gloopy mess in the oven 'bread' when it's overflowed the pan and is more 'blah'. And most importantly – I've learned to eat well, to make do on very little money, and still be content. This bread looks great. The very first time I tried to make GF French bread, I just replaced the regular flour with my GF mix. Yeah, that didn't work so well. I've been experimenting and it's gotten better, but this looks great! Oh Yay! I was hoping you'd share the recipe for that gorgeous loaf. I'm off to the kitchen. Hehehe – I just made this and posted about it (on my very new blog) after seeing it on the Healthy Bread in Five website and the nod to you and Danny in the description! It's great bread! I've also been loving their brioche recipe that Aran posted several months ago. So many bread possibilities have been opened up! What have I learned about gf baking? That I had to re-learn much of my baking training. But once I did, baking now feels second nature again. And THAT has made me realize that anything is possible, and that neither I, nor anyone else, should have to settle for sub-par food. Im new to GF baking, but I've learned that I have to keep doing it over, and over, and over to get it right. I made the pie crust recipe 4 times before I felt like it turned out. I've definitely learned to experiment! Knowing upfront that a recipe may take a couple tries makes the baking process less stressful. I'm excited to try this! Most of the recipes that I've found require a dutch over or a bread maker. I'm thrilled that I can make this one! That boule looks delicious! The one thing my son has never had is good, artisan bread. Now he will. The rosemary, overwintering in my kitchen, is next to me as I write this. I have learned that the key to baking/cooking gf is to try. My husband is sensitive to wheat and is lactose intolerant. Between them, my kids are (severely) allergic to wheat (and all things gluten), oats, dairy, eggs, nuts, peanuts, most beans and legumes, sesame, coconut, corn, and a few other oddball things. Oh, and my oldest son is vegetarian. My goal has always been to make food that tastes good and isn't a shell of its former, unsafe self. After six years, I still get tears in my eyes when my kids can eat a treat I baked, because I TRIED. I had friends over this past weekend. When my friend, who has CD, realized she could eat the biscotti I baked, I saw that look in her eyes. She said she hadn't been able to eat biscotti for years. I am grateful that there are so many gf and allergen-free products available (we couldn't live without Enjoy Life chocolate chips!). I am honored when friends and family take the time to prepare or buy food that is safe for my children to eat. I do have a few tips. Pick your favorite gf flour blend and keep a lot of it (pre-mixed) on hand. Then you can whip something up really quickly. Always use xanthan gum (or a substitute) to help your flours/starches stick together. Rice milk is an excellent substitute if you have to avoid dairy and soy. If you are also baking without eggs, try adding 1 tsp lemon juice in 1 C. cold water (substitute for some of your liquid ~ adjust quantity if your recipe calls for less liquid) and be sure your recipe calls for baking SODA (or add 1 tsp). The lemon juice and baking soda will react and it will help your baked goods rise and be fluffier. If you are at high altitude you can also increase your baking powder. I have always felt that the most nurturing thing is to feed someone. Try. There is so much amazing food out there! You can view it as deprivation or you can take it as an opportunity. Feed yourself. Feed your family. Feed your community. Feed your soul. Oh Shauna, that loaf is just beautiful. The caramel color on the crust studded with the black olives is really stunning. I can not wait to make your loaf! Thank you a thousand times over for your dedication to making wonderful g-f bread. We could never have developed this loaf without your generous advice. Do you think I could bake this bread in a traditional loaf pan? I don't have a dutch oven… Would it work out fine? I've learned in my limited experience to experiment and try, try again! I am not a 'gluten-free' person myself, but have started to learn to cook and bake for a very dear friend who was FINALLY) recently diagnosed after YEARS of unbeknownst self-induced torture b/c of her love of all things baked. Being able to share meals with great friends is something I treasure, so modifying/finding good recipes and turning them into great gluten-free fare means lots of research and experimentation…but it's well worth it. I'm excited to give this bread a shot for next time she's over! Putting aside my frustrations at being a novice gluten-free baker — when I baked so much whole grain artisan bread before that I didn't need a recipe — has been challenging. It hasn't always been worth it to try to bake something that may very well be a waste of time and money. I am grateful for your site — that I can trust your recipes. Thanks! I've learned (and am still learning) to let go. To let go of the idea that everything has to be perfect (the first time, of course). To let go of the idea that the flours and breads and cakes are something to be rationed or hoarded. Some expensive things may need to be occasional indulgences 'cause they're pricey, but this is how I eat now – it's not some strange and unusual experiment to be kept off to the side. I recently learned that in addition to gluten, my body produces an immune system reaction to eggs and that is why my gut is not healing. I am going to try this bread substituting ground flax seeds for the eggs (1 T gr. flax seed to 3 T water per egg). Will let you know how it turns out. The main thing I've learned about GF baking and cooking in general is to approach it with a sense of abundance rather than deprivation. I am so grateful for your blog and books and Facebook page –all of which buoy me up and give me such joy as I make my GF way through a Gluten-saturated world. I've learned that baking gluten-free is hard! I've tried before for someone I knew and failed miserably. This looks so much better than my attempt. I stopped baking for a while recently due to the stress I developed from one failed recipe after another… but the most important thing I've learned about gluten free baking is that the failures do not make you a bad cook – the zillions of loaves of not-quite-right or horrendously-wrong gluten free bread that have ended up as breadcrumbs (or in the compost) are a testament to our unwillingness to give up. Perseverence is the most important thing for us glutenfreeders! And thank you so much for sharing such a wonderful resource! The cookbook looks wonderful. I can't WAIT to try this bread! Maybe this aft. after my acupuncture appt. I haven't learned much yet about how to bake GF except to let go of all I knew of gluten baking. It's like learning to walk all over again. That bread looks amazing. I've been trying to perfect gluten-free muffins, but I think it's time to just switch my focus to breads. Bye-bye Costco rosemary bread I-can't-eat-anymore-anyway, hello heavenly smells from my bread machine! I managed to harvest a pile of rosemary as the frost hit this fall, (around 9 PM in the dark with my flashlight as the coyotes yelped in the woods behind our house). So this will be doubly enjoyed! Thanks for the savory preview!!! I have to admit that when it comes to gluten free baking, I haven't yet tackled bread. I've made cookies and pies, but no bread. So far, same as with my vegan baking experiences, I've learned to appreciate all these baked goods for what they are, tasty treats, without comparing them to anything else. I would love to be entered into the draw for this book so that I can give gluten-free breads a proper go. I would love to enter for the drawing. One thing I have learned about GF baking is that the cookies tend to be a little more delicate. So I am more careful about how I store them (using crunched up wax paper so they don't mooch around in a container, etc.). Yeah, it's more important how they taste (and I'm getting Really good at that) but it's also kinda nice when they don't break apart to bits. Beautiful! I am trying that bread this very day. Being gf has necessarily taught me how to loosen up and get comfortable in the kitchen, and especially that I don't have to settle with the results of any particular recipe, but that I can experiment and tweak to my heart's content. At first it scared me. What if I mess up and waste all those expensive ingredients? Then I began to realise that it isn't that difficult, once you get a feel for the flours and how they interact. That, and armed with kitchen science, you can do absolutely anything. It simply will never be exactly like the wheaty thing. At least that has been my experience. You can come close, but it's never exactly alike. Perhaps this book could persuade me otherwise :). My 1st gluten free baking was adapting a favorite zucchini bread recipe for my son's girlfriend who has celiac.Asalways I pulled out all of the stops: softening the raisins, walnuts and dried pineapple and ginger bits per-baking. Extra spices as always and oats (from Bob's red mill GF). Gently stirrd clockwise only and baked with love. The girl's 1st reaction was that I hadn't understood what gluten free meant! A success! Still learning and can't wait to try this new flavourful loaf. What have I learned about GF baking? It is one of the greatest expressions of love I can show my gluten-intolerant husband. I have never been a baker, so I want to learn so that he can have delicious breads and sweets. This blog inspires me to want to bake, despite the time and effort, for him, for our family. I feel blessed to be able to learn from Shauna and everyone's comments. My mother-in-law did not have such advice or products available when my father-in-law was diagnosed 20+ years ago. She still struggles because she hasn't embraced the new possibilities. I don't want to avoid food, but learn a new way to enjoy cooking, baking, and eating. i really don't know enough about gluten-free baking other than i need to learn! i am still consuming food that i am sure causes fatigue and pain but know that i need to make a change! Thank you for such a wonderful blog. I have very recently become gluten free and struggling through the initial baby steps that I'm sure all of you can relate to. I am a huge baker and I know I have to work through making this adjustment. My two gf baking attempts so far have not been good … I'm ready for the challenge though. I conquered vegan baking and I can do this too. You give me hope! All praise be to those of you who work so hard to make the life of gluten-intolerant people …. TASTE FULL again! My #1 love in life is my husband, who has Celiac disease. My #2 love in life is Kalamata Olive Bread! My husband remembers…years and years ago in his distant past…loving the taste of freshly baked olive breads and looks longingly at the vast array of freshly baked breads are our local market each time we shop. I know my husband loves me when, after I've had a hard day at work, he shows up at home to present me with a Kalamata loaf to soothe my worldly aches. His only request? That I allow him to sit just close enough to enjoy the aroma of the bread as I dip it in olive oil and Balsamic vinegar and savor each incredible bite. Imagine the look he'll have on his face when I'll be able to present him with his very own loaf of Kalamata Olive bread!!!!!! Oh goodness, this comes at the most perfect time because a friend just told me about this book. I've learned that I need to roll up my sleeves, read the directions slowly and focus on the process as well as the result. I tried my very first GF baking this weekend and was heartbroken at my results. I'm bouncin' back and I'm going to take the bull by the horns this wkend. One thing I have learned is that gluten free baking has its own learning curve. One that is multiplied when you also need to do so dairy free and at altitude! I am loving learning though and would love to have another resource to use. Eep, just found your blog and its AMAZING!!! What an amazing resource, thank you so much! Funny, I discovered they had another book out just yesterday! I am quite excited about it because "Artisan Bread in Five Minutes a Day" is great and all the breads I have tried from there turned out delicious. I am a real rookie at gluten free baking, so unfortunately. I am starting to have more interest in it because people around me have gluten sensitivities. A coworker recently brought to work the best "éclairs au chocolat" I have ever tasted, and they were gluten free. Anything is possible!! Thanks for experimenting an sharing! I personally have learned that for those of us have multiple allergies, imitation food flavors can make a big difference. It's important though that it is imitation. If you can't eat dairy, add a little imitaion butter flavoring to your biscuits. If your allergic to coconut or almonds, add a little flavoring to your cookies or cakes. The flavorings add another layer of flavor to your lives! This is a beautiful loaf and I want to have a piece. Before becoming gluten free I had never made a loaf of bread. This is both good and bad; good because I don't have any preconcieved notions, bad because I don't have any bread making expertise. So far all of the bread I have made which comes to 6 loaves in two years have been a failure except the last one. What made the difference for me? Proofing the yeast (this was on the Internet – I did not know to do this on my own) and warming the eggs to room temperature. I am determined to keep on trying to bake bread because I really like to have toast with eggs. This bread looks great, I am excited to give it a try. I didn't used to bake bread before my son's CD diagnosis so I have nothing to compare baking gf bread to, but what I have learned is to half the recipe the first time – it may not come out exactly as planned but at least I can tell if it is worthwhile before using up a lot of ingredients. I am excited to try it, thank you. What a fabulous review on their book, you are such a talent with words. You are right– we all learn from each other, I am glad that many years ago my Cooking Gluten-Free! book helped you when you were first getting started and now you have helped so many others along the way. Congratulations on completing your book, it will be so exciting to peek at that galley when it arrives. We should get together sometime with our mutual friend Nancy G.(working with Tamara) Cheers! i started realizing more and more just how lucky i was to not be able to eat wheat/gluten! the gf world is full of healthier, more tasty and just plain more interesting alternatives. grains and nice things i don't think i ever would have tried if i was still a gluten girl. so, i realize that i (along with all of you other gff's -glutenfreefolks-) are truly truly blessed! thanks, btw, for your neverending and always inspiring enthusiasm. The one thing I have learned about gluten-free baking is to try, try, try. It is so rare that I try out a new recipe and it works. I can't imagine if I quit trying after one failure. Bread would never be in my life again, pies would be out of the question, and cookies would be gone forever if I did not keep at it. Gluten-free baking has taught me to never give up and to accept that everything is not perfect. When I first started out gluten free, my baking was good, then something went array and everything I tried to bake was a flop. It scared me and I went off baking for quite a while. Recently I've started up again and things are working … because they are working I'm more excited to bake and more adventurous in trying new things. The one thing I have not tried to bake for myself yet is gluten free bread. I think this book would be an excellent opportunity to start! Wow, I went gluten free last September after years of illness and being poked and prodded by all sorts of doctors. The change has been AMAZING and I feel like I was given a new lease on life. Prior to going GF I was an avid baker and I have been missing fresh crusty bread. I am looking forward to trying this recipe and improving my GF bread baking technique. Thank you! Must have that book! I'm just now going gluten-free and it looks like just the thing I need. Gluten-free baking taught me to take my time. Back before I was gluten-free, I used to rush through a recipe, tossing ingredients together in anticipation of the end result. No more. Now I bake slowly and more mindfully, playing with substitutions, enjoying the journey as much as the destination. Oooh, that's beautiful, beautiful. I'm going to bake this as soon as I possibly can. Thanks! My mother was diagnosed with Celiac disease in 2006. She suffered nigh unto death prior to my insisting on bringing her back to the hospital yet again and insisting on a diagnosis. Since then she has slowly improved. There was so much damage to her intestines.Malabsorption is a huge problem for her. Sunday she celebrated her 75th birthday. I made her a flourless chocolate cake from a recipe from "Annnie's Eats" blog. I was so thankful to be able to make her a cake complete with birthday candles all because of the blogosphere. I can't thank you and others like you enough for sharing your knowledge with us. Hi Shauna. Great minds think alike. I had just posted a GF bread post (www.tablavie.com) last week and for those who don't want to spend a lot on flours, one of the breads I featured only uses tapioca flour and white rice flour. I can't believe how great it tastes. I even offered some to our gluten-intolerant waitress at a local restaurant after she had graciously warmed it up for me and she couldn't believe it either. Having good bread is one of those things that makes me feel like a person again instead of a condition. No matter the recipe, nothing beats hearing the hollow sound of a fresh made loaf then (after the long 15-20 minute wait) tearing off a piece and hearing the crust crunch and seeing the crumb pull apart with the elasticity of a perfect bakery baguette. So cheers to bread making. Thanks for a great site and looking forward to your new book! What I've learned about gluten-free baking is to not reinvent the wheel–so many of you all making such wonderful gluten-free recipes, no reason for this newbie gluten-free gal to start from scratch. I can't wait to buy this book! I too was using "Artisan Bread in 5 Minutes a Day" until I cut out gluten and I've been feeling oh so sad that it collects dust now. I have learned that you have to make sure yeast is alive before you use it. That gluten free dough puts up a battle against a hand held mixer. Finally, that once its baked, it could double as a brick. But most of all, that w/ butter and jam, it was delicous, safe to eat and I made it! I aim to improve. I am new to your blog, but am so far fascintated and inspired by what I have read. I am newly g-f. I don't have celiac, but was introduced to the idea of being g-f by a book called "Eating for Your Blood Type" Did you know that people with type O blood should not eat gluten??? Needless to say, a couple of months of being basically g-f have done wonders for my health and weight. (I say basically because I don't have to be so hyper-sensitive to things like trace amounts and cross-contamination.) And I am not deprived, I am eating better than EVER!!!! Now that I see how unwell I feel when I have any substantial amount of gluten, I am sold on this as a lifestyle. BUT-I have been scared to bake…and I love to bake:( All the flours and such are intimidating, and I am perfectionist, so the idea that things may not turn out the first time is intimidating to me. I have a very dear friend who is also g-f for blood type reasons, and she gives me bread, but I want to do it for myself! 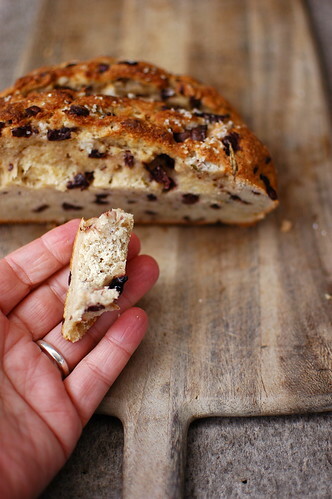 I think this olive bread has inspired me to take the plunge and try:):) We will see how it goes…but at least I will be taking the plunge. One question…someone else asked also, I live in a tiny apartment…not a well-equipped one (my fault)….so…can I bake this on/in something other than a dutch oven or pizza stone??? What about a regular cookie sheet?? I am looking forward to becoming a regular reader! What do you think would happen if I tried the recipe without eggs? (Maybe some egg replacer or flax seeds?) We've got an egg allergy here too in addition to gluten, but I'm dying to try that bread. Can't say much yet about what I've learned, since we're just starting here. I guess I'm learning it's okay to try new things! Your blog is overwhelming. My two sons have both been diagnosed with food allergies within the last year. Our lives have been literally turned upside down. In order to prepare recipes that both can eat, all recipes must be gluten free, dairy free, egg free, soy free, and nut free. They can not contain tree nuts or molasses either. And so I ask do you have any recipes or a collection of recipes that follow these guidelines? I know the basic consistency must be rice, potato, tapioca, and or corn flour. I would so appreciate your help! You can respong on my blog http://funwithfoodallergies.blogspot.com. I've learnt that GF-baking is much like life. If one avenue fails, there is always another! When I get discouraged about the failures in my gluten free baking, I remind myself that I know more today than I knew yesterday, and get back in the kitchen and try again. It's exciting when you finally get to the point at which you have your own "repertoire" of recipes that really work!! what i have learned is that gluten free baking is not easy! i have gotten down brownies, that's about it! i cannot get cookies or bread down yet but maybe i just haven't had the right recipe! i want to keep trying! I have learned that… no matter how clean and new your pre-GF baking sheets seem to be, you still need to use it as an excuse to go shopping for new ones! Seriously. It took me awhile to break down and buy new ones, and it has made a difference! 107th commenter. And I have no useful tips on GF baking as I have not yet progressed beyond the expensive store bought GF mixes. However, I wanted to comment on the disappearance of words you had written in your head. I wrote about that very thing in my blog on January 13th. I think we should name the phenomenon, maybe something like The Death Knell Phenomonen of Pre-Writing. Something short and snappy would be better, but that is all I have come up with so far. I have learned to be very patient and very open-minded and to not get frustrated if something doesn't turn out right the first (thousand) times. Really, the biggest lesson I've learned is to just keep trying. And not be afraid to try new things. Just because I've done things one way doesn't mean learning a new technique or trying a new flour can't make things even better (or worse, but then at least I'll know). The other fun thing I learned recently is that my local co-op sells bulk yeast for about a $1 a bag, versus whatever it costs per bottle ($5 maybe?). For me the biggest lesson is that I can have what the "normies" have, if I'm creative. This is true of most college kids, even the ones that can eat gluten. This past weekend, my friend and I really wanted pizza. So I looked at what I had (quinoa flour, arrowroot starch, and a bit of Bob's Red Mill all-purpose mix). I used your pizza crust recipe, swapping the flours and starches, and found I didn't have enough…so I took my coffee grinder and pulverized some rice! My friend was completely shocked that you could even do that, and the pizza turned out WONDERFUL, even if it was rushed, sloppy and thick (we didn't have enough toppings for two pizzas…so we just made one thick-crusted pizza :P). It was the first time I felt that I didn't have to PLAN for weeks, that I could say "I want pizza", and I could just…make it. Mmmm… I must try this recipe soon! We've been GF for 3 months now and have found we are not missing a thing. Even my go-to chocolate chip cookie recipe has been declared better with GF flours than before by my husband and 2 boys! Yay for not feeling deprived! I loved the rosemary loaf made by Essential Bakery and I stopped going to Macrina because it was all together too painful to reject the olive bread. I can't thank you enough for this post! I've learned that gluten-free cooking and baking can be delicious! I thought that giving up gluten meant giving up everything that tasted yummy, but that hasn't been the case at all. GF isn't something that I ever considered myself doing, I've gone gf for my own reasons after developing a wonderful array of recipes and foods that can be more than enjoyed without the need for gluten. One of my best friends is celiac and while we love to host dinner parties she was always very skeptical to come and enjoy herself as most of our friends do not consider her diet when planning a meal. I stumbled across you blog quite some time ago and haven't stopped reading since! I LOVE that you 100% enjoy everything you cook and share with us. I have learned so many wonderful things and ventured into a world of cooking I never saw myself in. I am FOREVER grateful for the experiences and information you share. We gladly host dinner parties at our house many times a year, monthly for sure, and serve an entire menu of gf items and everyone raves, I owe a lot of that to you and your website, without it I never would have attempted to cook gf, I probably wouldn't have known you could cook gf! I have also referred many friends to your site, so they know what they are missing and must try next! I will be making this bread and buying their book, for everything it has to offer! Hmm, just one experience? 1. Most importantly, I have learned that expressing your needs to friends, family and restaurants is ok – 9 out of 10 embrace the challenge. 2. Gluten-free baked everything is better frozen first (really weird). 3. Don't give up, if the first attempt is not just right, keep experimenting – you will win in the end! I have been trying to cook GF for healthy reasons (not medical ones)… and what I discovered is lots of new options for food. I agree that you have to accept that things are going to be different, albeit delicious, from the gluten-loaded dish. That's the hardest for my husband! I have learned that if a recipe has 1/2 cup or less of flour (as the amazing cocoa brownies on Smitten Kitchen do), I can substitute the same amount of Gluten Free Pantry all purpose flour, and the final product is indistinguishable from a gluten-filled baked good! So I can have brownies again. A small thing, but a triumph. I was diagnosed almost 3 years ago. I used to love to bake, bread especially. My first attempts after receiving my diagnosis were so disastrous, that I stopped baking for a while. I did find one or two dessert recipes that I was finally able to master, but I never could find the courage to try my hand at bread. Then came Thanksgiving and my brave husband, who has never made bread before in his life, made GF bread that was delicious. Following his lead, I've slowly started to find my bread baking confidence again. This recipe makes me want to get back into the kitchen ASAP! Oh my goodness. I recently made the crusty boule from their website (in fact, I have some dough still in the fridge and am dreaming of cinnamon swirl bread). It's GOOD. Good toast, good peanut butter sandwiches…yum. What have I learned about gluten free baking? Probably the same thing everybody else has had to learn: you have to change your expectations a little. Gluten free baking can be so delicious (especially now that we have all these fabulous people working so diligently on new and improved recipes), but it won't have the exact same structure and flavor as foods made from wheat flour. Accepting that and moving in with an open mind to explore these new flavors is everything…and so much more satisfying. Other than that…I'm just filled with gratitude to everybody who puts in her/his sweat and tears (and money) to help make the gf baking experience better for everybody else out there. How lucky we are to be in this age of the internet and have access to you guys! I haven't done a lot of GF baking so I haven't learned a lot of tips. What I've learned is that the recipes tend to be more sensitive to measurements than my glutenous ones. Oh and I've learned about the taste of wheat – I didn't notice it that much before going GF. I've been gluten-free for a year and I'm still terrified of making bread from scratch. I haven't built up my gluten free ingredients in my kitchen, so I would have to do some shopping. I have made a simple pie crust and some gluten-free cake and brownie mixes from a box. I've pretty much given up on bread. There is a wonderful gluten-free bakery near me (Rose's bakery, http://www.rosesbakery.com/). Their bread is the best I've had so far, a little dense, but better than most. The only problem is that they are $10 a loaf, which is a little pricey for my budget, so loaves of bread have become a treat for me. The breads in the Whole Foods freezer section are not worth buying because they are crumbly and very dry. I do have to say that being in Chicago allows me to have many more gluten-free options than some, which I am very thankful for. This recipe and cookbook have definitely got me interested in making my bread from scratch. It looks like the real thing and I know I can find all of the ingredients that I need. Thanks! Wow, I don't need to eat gluten free but can certinaly see the health benefits in doing so. I'm really curious to start delving into this area of cooking and have now found the perfect resource. I can't wait to peruse more of your recipes. After initially eating the disappointingly "white-bread" tasting crackers & breads and such from the box, I discovere you! Gluten-free bloggers have taught me so much about working from scratch, relying on whole foods, and even getting my kiddies more involved. When I discovered AB in 5, my first thought was to send it to you and insist that you come up with something! Imagine my pleasure at seeing the recipe on their blog! Wow. I'D like to inhale this, and I've got a pile of plain-old-wheat dough rising as I type. What an inspiration. Gluten-free bread is like the holy grail: difficult to attain and rarely what you expect. I have learned that combinations of flours and starches result in the better breads, and that "real" tasting gluten-free bread is something of a miracle. I am only just trying bread again, and this would help me along the way. Another tip: put a ramekin of water in the oven/on the baking sheet to increase the moisture within the oven and produce a soft bread with a nice crust. My advice is the same my kindergarden teacher taught us about, well, everything; if at first you don't succeed, try, try again! I have learned in my 3 yrs of baking GF that nothing is a fail. You learn something from every outcome. And also that I don't really remember what glutenous bread tastes like anymore! Oh, Shauna, isn't it exciting? I need to thank you, am very late in doing so!! Your post on Dutch oven bread planted a seed in me which actually came to fruit, as it were, last month! I'm so grateful to you for the guidance and inspiration, and have credited you on my Blog… there is no substitute for great bread! This latest one of yours is very similar in ingredients to the one I've been making, having been inspired by you and Jim Lahey… Isn't it wonderful? Thank you… thank you… And thank you for the resources, encouragement and great heartfelt writing. ps word verification is "grati" how perfect. One thing I've learned over 10 years of GF baking is that when I find a recipe I like, I set up a row of zip-lok baggies and measure out all the dry ingredients at once. Then I zip and store. When I want to make that item again, I grab a bag and proceed with the recipe. Saves a lot of time getting out all the different flours and gums……. And quite easy to vary the final product with different herbs, nuts, seeds, etc. Oh I want this bread with a big bowl of mussels. To dip this bread in the mussel sauce yummy, yummy. I'll have to try this in the next week. Thanks for the wonderful recipe. oh my! i am making this one next. gorgeous photos! 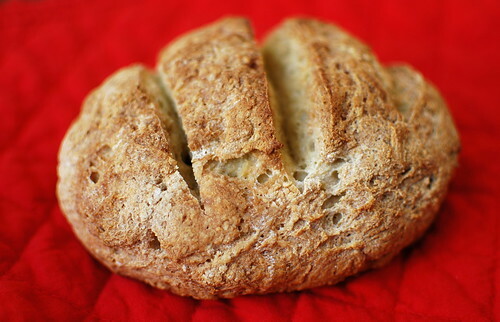 I'm currently doing a 21 day gluten free, vegan diet and I made this bread (off the ABin5) website this morning. I replaced the eggs with a vegan powdered egg product. It's the best GF bread I've made so far. I'm not surprised though, because I usually have a batch of the regular ABin5 bread in my refrigerator at all times. I'm a newby celiac…diagnosed 2 weeks ago…what have I learned about cooking/baking gluten free? That my creativity in the kitchen does not have to be stiffled…one look at that bread and my hope is renewed! Thank you!!!! That looks amazing! I can bake amazing deserts that everyone will love, even the gluten eaters. I haven't conquered bread, though. Baking bread is a strong tradition in my family, but we haven't made the GF leap. They bake bread, I watch them eat it. This recipe makes GF bread, real bread that even my husband will eat, possible. I made the rosemary-kalamata bread and it's wonderful! So far I've eaten half of one loaf by myself. I'm thinking the other half will be gone by the end of the day. Gluten free baking has a lot of heighs and a lot of lows, patience is my tip and keep trying explore different flours and methods and enjoy new textures and flavours . Tricks for GF bread baking? Number three: Farm fresh eggs! Number four: Bake in that cast iron Dutch oven and get it smoking hot! Number five: Drizzle top of loaf with olive oil and truffle salt. Number seven: Don't tell your friends it's GF, they won't even notice. I love your blog and it has helped us transition into the gluten free world. My son has celiac disease and my husband is gluten intolerant so we made the big switch to all eat gluten free. We loved the Artisan Bread in Five Minutes a Day and were sad the day we had to give it up. We are so excited to try it now with gluten free ingredients! We've discovered so much in gluten free baking and that there is just as much to love as there was in gluten baking. I would say that what we've learned is that you need to dive in and try, try, try and you'll end up with something you love. I have learned that if I keep in my mind what I ate before I knew about food allergies as the gold standard then I am missing out on a whole other experience. I don't try to REcreate any more, just create. Eat my food and know that the ingredients are good and nourishing for what they are, not what they are not. In short, I do not set myself up to fail anymore. What have I learned about gluten free baking? I have learned that you must keep trying, continue experimenting, until the recipe brings you happiness. Then when it is just right, a smile to my face, I can say "perfection." i've learned to appreciate croutons and bread crumbs— why waste a good failed bread? i made up a huge batch of delicious meatballs last week that transformed past bread disappointments into tasty treats. I have learned as someone else said, To appreciate food for what it is. So most things will never taste the same again. 🙂 its ok. Time to learn new things to cook. Find new ingredients (this got me excited) to try. Dont be afraid to add to a recipe. TRY EVERY RECIPE! i have tried things Ive never even thought of! I have a very new appreciation for foodies and food bloggers. I learned my husband prefers GF baked goods to the gluteny kind! That was a surprise. I also learned not to be afraid to add a little extra Xanthum gum if the recipe is not just right. That honey makes things moist and tastes better than sugar. Bananas do the same and are tasty in brownies. Always edit! I try new things with most recipes and keep track of what I try in gourmet recipe manager program.When they are perfect for my tastes I print and add them to a 8×8 scrapbook album that is my cookbook. Its nice to have all my favorites in one place. My books are on the shelf but MY cookbook has the recipes we use over and over. Cant live without it! Thanks Shauna!! That looks beautiful, and I can't wait to try the recipes. When you think of it, I've learned things that would improve my baking, gluten free or not! When will we be able to purchase the new cookbook. Frankly, I can't wait! Thank you so much for posting the Boule recipe, it's amazing! I made the recipe from Artisan Bread's website and stayed up late last night waiting for the first loaf to come out of the oven. So yummy, so simple and just beautiful to the eyes. I'm going to try a loaf with fig and fennel, hot pepper loaf and maybe a cinnamon raisin. I've ordered the cookbook, can't wait to try out the rest of the recipes. Second: GF bread does use more liquid than G bread, but too much liquid can result in a multitude of disappointments. I'm finding less is often more. I learned not to buy the mixes at the store. Too crunchy for me. Shauna my HB5M book came yesterday and I baked today. Just as you promised, a gastrophany! It's a plus on my blog. YUM. oh i am drooling! i've done very little gf baking. mostly i've used mixes – i definitely will try this one. I love this! And i'd love this book. I was once an avid breadmaking teenager, who was diagnosed with celiac a few years later and have only recently attempted to make GF bread. I've learned not to miss the lovely elastic, kneadable dough, and instead focus on batter that rises and tastes good, and can be toasted with cheese…or honey…or nutella. Well, here is the thing. I haven't learned anything yet. I am newish to gluten free and have just been using premixed flours. I am hoping to become more ambitious and start using my own flours. I will need a great cookbook when I do and this looks like a great one to start with. WOW! I am so excited about this. When I discovered that I'm wheat, soy, and corn intolerant, I thought my bread-baking days were over. I guess not! This looks divine. I just need to start assembling the ingredients. The food budget is tight right now, and those flours are kind of expensive. Wow, yum. I am still learning to bake gluten-free, but I think after a while, I learned that not trying to imitate gluten-filled breads, and instead enjoying the wonderful characteristics of other gluten-free flours, was the way to go. I've learned that quinoa flour makes a lovely flavor and crust to a "french" bread. I've learned the value of obtaining as much lift as possible through eggs/egg whites, yeasts, etc for my bread. I've learned how much xanthan gum to stick in recipes. And I've learned to accept that all of my trials will not be perfect! Ok, I know one more comment added to the 179 who are all saying the same thing doesn't really have much impact, but I've gotta say: this bread is MIRACULOUS!! It was so wonderful when it came out of the oven CRUSTY and smelling fantastic — so I ate most of a loaf for dinner! I took the other loaf into work to share with a fellow gluten-free person, and she didn't believe that it was gluten-free until I showed her the recipe. She's trying it this weekend… THANK YOU!!! Just pulled my first attempt at this boule out of the oven. Waited, maybe 10 minutes, delicious. Thanks for the recipe. Can't wait to make another loaf or two, the first one is almost gone. i am SO GLAD to learn about the GF section of this book. i had no idea. I've learned it's worth all the effort of mixing flours and then baking to keep my kid healthy, happy, and feeling un-deprived. You really just need a good recipe and a little practice. 1. It's is rare to convert a recipe from gluten to gluten free in one go with straight flour conversions. 4. Stay eternally optimistic – as you have shown you always get it right (eventually)! 1) You almost always need to add more liquid than the recipe calls to ensure a moist cake/bread/cookie/etc. I sometimes add an extra egg, more oil, or more liquid, depending on the item and the desired consistency/texture. That's lovely!! The main thing I've learned is to (1) not go overboard on the tapoica flour (or everything you make has the texture of mochi), and (2) experiment, experiment, experiment! I've discovered my fave flours to bake with are sweet rice flour (Mochiko), millet, sorghum, and montina, I made some lovely nutty montina chocolate chip cookies yesterday, and they were AWESOME. My Mum doesn't have celiac's, but is gluten intolerant (gives her a horrific belly ache). So she can eat Spelt flour (which celiac's cannot), and the first thing I tried to make her was these pineapple cookies that she used to make for us when we were little, but they came out much too dark, heavy, and dry. I cried. But then I made them again with a GF mix of flours, and they came out delightful! I learned that Spelt flour works well for brownies and darker breads, but to use true gluten free flours when replacing something that originally called for white, light flour. I also learned how important xantham gum is when baking gluten free! Grateful for the opportunity to win the bread book…sounds simple and yummy! YUM. Can't wait to get the baby asleep and start baking!! My gluten free baking breakthrough happened when I realized that sometimes, no matter how perfectly a recipe has been followed, the bread just won't work. And it's okay. I don't mind getting the occasional stumpy loaf, or one with a few extra air pockets. It still smells like heaven and tastes the same! "But wait a sec…that pie crust actually tastes good. What did you say it was made from??" The pleasant surprise of g-f baking will eternally be tricking non-g-f people into loving my creations, simply because they are delicious. Even if they're made out of flours they can't pronounce. OK. So I got the book and am planning my weekend baking but I don't understand the difference between enriched and non-enriched recipes. Which gluten-free recipes are enriched and which aren't? Enriched with what? Thanks for your help! Patience, determination and ways to use baking projects that didn't quite make the cut. Also, did I mention patience? Thanks for introducing us to Jeff and Zoe! I'm so excited! I have their original book. It was given to me as a Christmas present, then my daughter needed to go gluten free. I ordered the book just now and am so thrilled that they included GF recipes. If I win, I'll give the copy to my friend who is trying to go GF also. I ordered the book from your Amazon link. Is it out of print? I could only order it through a third party. When I read BRIOCHE, that was it! I miss brioche so much!! You've inspired me to be more brave with baking recipes and I finally nailed Monkey Bread. My kids always want it for their birthday breakfast and this last week, I hit the right combination. Light and flaky and gooey! Hey! I just found your blog this early A.M. while looking for a new (better) blueberry muffin recipe for my family. Well, they are fabuloso and I can't wait to try some of these bread recipes. What I have learned so far in my GF baking is to add a dash of humilty – I am usually a rather proud and cavalier baker – I want great GF baked things, and I am now willing to learn! I have learned so many things since my kids and I have needed to eat gluten and dairy free. I think one of the best things to happen though is the need to make the food my kids and I eat ourselves. We can't just grab a package of cookies at the market. We must take the time to make them. I think it is also teaching us some patience in that we can't always immediatley fulfill every food desire we have immediately. I am also enjoying the time teaching my kids to be able to provide themselves with food. This bread is delightful! I subbed sun-dried tomatoes for the olives (because I was out, not for lack of olive love) and subbed millet flour for the sorghum. Half became a loaf and half became a pizza. Both rocked my socks off. Hi! I made this as described and after the rise set it in the fridge overnight. The next morning, it had deflated by at least a third. It's not the yeast as I've recently made other bread with it and it's been fine. I've never experienced this before, but I've also never done the overnight thing with gluten free bread before. It seemed to bake fine, but it is very dense. Anyone have an idea of what happened? Hi I'm just getting started with gluten free baking and refer to your blop alot these days. These breads look so wonderful and keep me inspired! That looks delicious! I can't wait to try it. I've only been gluten-free since June but one thing I have learned already is that recipes tend to turn out better when you mix the flours yourself, instead of buying the mixes. I think what I've learned is to have fun and don't worry about failures. Those failures just bring you one step closer to success. Oh Good Lord, YES! Yes, Yes, YES!!! This post of yours makes me want to stoop and kiss your feet! I haven't been to your site in a very long time, so long, in fact, that you've changed it up since the last time I "stopped in". (Looks great, by the way.) I have always loved bread. I'm a bread girl from WAY back. When I tested positive for celiac disease, nearly 3 1/2 years ago, I knew I would need an endoscopy to "prove" to myself that if I was giving up bread for life, they better be damn sure this celiac diagnosis was real. You know the drill. Continue to eat gluten before the test. I can clearly remember buttering a PERFECTLY toasted english muffin, and gently kissing it before taking a bite. I may have given it a second smooch, just for good measure. Of course, the test showed near total villous atrophy, and the rest, as they say, is history. I've baked my own gluten-free breads, ever since. Some loaves are good, and some experiments are better than others, but mostly, I just say, "eh, it'll do." At least it's bread, right? Needless to say, this latest bread post has me excited! Break out the KitchenAid, baby, it's bread baking time! Needless to say, I'll be purchasing this book…no doubt about it! Thanks for the inspiration! I was once renown for my gluten-filled baked goods. I baked at least one thing a day because of all of my devoted eaters. An then came the news that the gluten had to leave my life for good. Thus began my foray into GF baking. I have discovered flours that did not exist in my world previously. I have been able to create new flavors, new textures and new fans of my baking. Gluten free baking has taught me to experiment, learn from my flops and celebrate my successes. My taste testers are gluten eaters and are very harsh critics, so the successes are even sweeter. Going gluten free has taught me perseverance. Looks amazing!!! I can't believe it's gluten free! I can't wait to try it! I'm going to run to the store now. i've realized that although i can make a mediocre baked good with a general "gluten free flour mix" (either my own or store-bought), it's so much more fun to experiment with different flours for different uses: chickpea flour in chocolate, soy flour with banana, etc.! I have learned about gluten free baking that I only have to try. I eat gluten. I bake a lot. Usually to make people smile. I have a new-ish friend with celiac. I try. It's not always perfect and there are some efforts that are more successful, but the fact that there is dessert for her, a rarity, is much appreciated, and I like the challenge and the opportunity to make one more smile. I've learned…well, at lot. At times, not very much. I think baking GF has taught me to be comfortable with my flexibility. I'm the kind of person that cringes when people ask me, "How's your schedule look?" I walk away thinking, "What is this thing they call, 'schedule'?" I don't have them because I am utterly right-brain to the core. A linear concept of time doesn't make sense to me, so I am unscheduled, spontaneous, and flexible. To many, that means I'm undisciplined, unorganized, lazy, and haphazard. I've often been ashamed of it, so I've struggled to fit. It may sound silly but I don't have to worry about this when I'm cooking. I can be spontaneous; I don't have to follow rules and if you're cooking GF, flexibility is a must! So, I can change gears, do it some other way, and go in whatever direction I wish to get to the plate. It's really one of the few places where my 'ways' are a real asset. I've learned to keep trying and experimenting w/new things. I've also learned to use the internet and blogs to give me new ideas to try. Wow, Shauna…this bread is AMAZING. I made the dough this morning, and we just sliced into the first loaf a half hour ago – and I fear that it will not make it to the dinner hour. This is the BEST bread that I have eaten in 8 years of living gluten free, and this one will be on my table for years to come. The olives and rosemary in the loaf is heavenly…def going to try sun-dried tomatoes next! Thanks for the recipe and inspiration! My GF baking tip is this: if you want a full bread/grain/pastry flavor, texture & nutrition you gotta have some actual grain. Starch + starch + starch may hold together well, it may be crisp and tender and all the other qualities we want, but it won't taste right and will likely not be very good for you. So, work in some sorghum/millet/teff/brown rice flour or other real grains. Your GF baking will be better than ever! I just made my second batch of this bread. The first one was too wet and too salty, but darn it, it was the closest I've been to good bread in a year. I inhaled it, imperfections and all. So now I'm taking a second whack at it, and I can't wait to master it! Thes best thing I've learned about gluten free baking is that I have so many options. and that it's crucial to have a sense of play because of it. Millet? Montina? Teff? It's glorious! My "limited" new diet seems to consist of me feeding my friends things they've never had before. going gluten free has made me really appreciate food… especially the work and effort good food requires. i never baked much before i found out i had celiac, and now i am actually using my kitchenaid and learning how baking is really a science. as i said: before i always LOVED food, but now i appreciate it. I thought about this bread all week and finally made it today. Let me just say that I have not had such delicious, crusty, flavorful gluten-free bread in 20 years. I ate half a loaf slathered in butter in one sitting. I came back to say this rosemary olive bread made AWESOME crostini. I dried out thin slices in the oven and ate it with good chevre. It was marvelous! Baking bread always scared me. Even before I went gluten-free, I had never attempted the yeast-knead-rise thing because it was a mystery. Four years of a bread-free life came to an end yesterday. I baked your artisan bread, minus the olives and rosemary, thinking…let's just see what happens. The crust came out crispy, the center of the bread was soft and the taste was spectacular. My mouth and my soul were dancing. I ate five slices slathered in butter before I stopped. This morning, I toasted it. Imagine. Toast. For the first time in four years…toast for breakfast! Seeing that photo and reading the recipe made my mouth water and my mind overflow with random delirious expletive laced thoughts. OMG, holy crap, I am SO EXCITED! I had given up on ever eating crusty/chewy European style bread again. I cannot begin to describe how much I look forward to trying this recipe. What have I learned from GF baking? To not fear failure. As nice as it would be, every meal does not have to be restaurant quality. What's the worst that can happen, that my kids have to eat something that isn't very good? Heck, most of their friends eat lousy food every day. Also, I've learned that bean flours make my baked goods taste like falafel. Ewww. All of the bread and pastry recipes look amazing! Just wondering if the rice flour can be substituted with another type of flour. Unfortunately, I am also allergic to rice. Any suggestions? Hi Shauna, thanks for sharing. I've been seeing so many great posts about awesome bread recipes from that book! Love your blog! I have learned not to undercook or everything will sink in the middle. My gluten-free bread isn't as forgiving as the gluten-filled kinds from my past. I am super excited about the new book. I have missed my 5 minute a day bread. I miss it so much I have hung on to the cookbook even though I can't eat a single thing in it. I've learned that you have to be willing to try different things. Not everything works, but sometimes you get a winner. Love the blog! Thanks for sharing all your great ideas. Oooh! I cannot wait to try (and sample!) this recipe. "Thank you for your post. I so enjoy reading your blog. Due to health concerns, I've recently been eating gluten free and cooking gluten free for both me and my Husband. Sigh- I've had to put aside my beloved breads and pastries – Sigh. As for gluten free baking, dare I say this, I've been eagerly waiting for YOUR cookbook to show me the way. So, I have yet to dip my toe in the water of gluten free baking, but I'm ready, willing, and able to give it a try. All the Best to you and your Family! As a mother of 2 gluten and egg free children, it's great to see something so beautiful. I'm always trying to unsuccessfully make bread and end up with lumps of sawdust. Would love to give this a try. Thanks for all the information you provide with such passion. This looks so delicious! Congrats on the cookbook! Here's the thing: I've been reading your site for what seems like ages now. Yesterday, after having a follow-up with my Ayurvedic doctor, she told me to go gluten-free. My first thought? Bread. My second thought? Shauna and the Chef. I was diagnosed with Celiac in December, and while I've jumped into gluten-free cooking (I'm the primary food preparer for my family) I didn't have the nerve to attempt and baking until reading your recent post. I order a variety of flours online (I live in a pretty small town), and last night decided I just couldn't wait. Ending up making a loaf of bread from your old favorite mix, the Gluten-Free Pantry French Bread that I picked up at Whole Foods. Not the most attractive loaf I've ever seen or made, but the smell of it baking and the joy of biting into the end result brought joy to the whole house. Thanks for the inspiration. Oh beautiful boule, I am going to make you today. I will not cook you just yet, no I will save you for tomorrow. You are going to be tasty and lovely and everything I ever dreamed of. I cannot wait for our date, because I know you are the "One". Thank you for this recipe and the book recommendation. I've baked a loaf of this bread- or a modified version of it- earlier this afternoon. I don't have kalamata olives or fresh rosemary in the house, so I used a favorite pre-celiac baking flavor combo (sauteed onion and dried Italian herb blend) instead. The dough seemed wetter than it should have been, which might be why mine looks more like soda bread than your beautiful boule. I also somehow managed to scorch something in my dutch oven, so I ended up baking the bread in a casserole dish. There's room for improvement, but my non-GF husband and I both agreed that it tasted very good and would qo nicely with soup for dinner (and in fact he just sliced off another piece for a snack). I've still got half of the dough in the fridge so maybe I'll be able to get a picture-perfect loaf the second time 'round. I made this bread for the second time today, and it was even BETTER the second time. The difference? Sitting next to a GF Pastry chef at a dinner this week, I peppered him with questions through the whole meal, and thankfully he was a good sport about my enthusiastic interrogation. But he recommended that anytime you're blending flours at home to put them in the food processor and whiz them around a bit together before proceeding to make the bread. He said that it helps to mill them together and add a little more lightness to your dough…and so it did. The crumb was even more open and lofty this time. Thank you so much for this recipe…it's a wonderful gift. Shauna, I am (as always) indebted to you for your recipies but also for information. I doubt that I would have ever heard about Zoe and Jeff's book otherwise. The GF Naan got my attention right away, and I went to Jeff and Zoe's site immediately. Naan is what I've missed most, after pizza. I bought the book – even though I could have gotten the naan and boule recipie for free because I feel I MUST support folks who are not GF but who support us GF people. Just like I bought your first book to support you. The dough is rising tonight and tomorrow I'll bake my son the boule and perhaps the naan on Tuesday if we get some time. Thanks again Shauna and Danny! One thing I've learned with gf baking is to enjoy the different flavors of different flours. I remember enjoying baking before going gf and although I would try numerous recipes, they often came out tasting the same. Sometimes there would be a slight difference in taste, but all would be similar–mainly because only wheat flour was being used. With gf baking I have tasted a wide variety of flavors, but am still learning and will always continue to experiment. I have come to find the types of flours I really enjoy as well as one's that are not my preference. I feel that gf baking has opened me up to experiencing new things and not being afraid to try anything new. I have realized some flours work better for cookies (i.e. buckwheat) than it does in bread, but some work really well in bread (i.e. sorghum and millet). Sometimes you just have to laugh at how things turn out- especially the odd shaped and colored bread loaves. Even if things don't turn out right it's fun to keep experimenting with flours and recipes because how else will you learn what you like and don't like? I've always loved to bake even before going gf and while I have had some frustrating and disappointing moments in baking gf I am not the type of person to give up, but to keep trying until I find something that tastes good and that others will enjoy also. Shauna, I would also like to say "Thank you" for writing your book. Before going gf I did eat healthy, but was somewhat picky on the fruits and vegetables that I would eat. I, for some reason, had this perceived notion that alot of fruits and vegetables wouldn't taste good or I didn't like them (when I really hadn't tried them). After reading your book I realized how much people do rely on processed food and how there really isn't much taste to processed and packaged. I have since found many more fruits and vegetables I love and can't seem to get enough of. I have found a lot of foods I used to eat no longer appeal to me because of their lack of taste, so thank you for writing about your experiences, and helping me find foods that I love, are healthy, and taste delicious. Honestly, I've been in a lot of denial over the last year and half. My issue is a wheat allergy, so I know that deep down I hoped that it would just magically go away like some minor allergies do. My mom would check out books from the library for me and I wouldn't even pick them up. I just didn't want to commit to learning something I didn't want to deal with. I was also greatly discouraged by the cost involved given my rural location… it either involved driving an hour or costly items at the grocery store. The pre made stuff tasted awful, and I thought "WHY BOTHER?". What I learned most in the kitchen was there are somethings that are normally made gluten/wheat free that I had overlooked. Things like skillet corn bread, only has cornmeal and is delicious and I got the recipe off the bag of cornmeal! Polenta is another wonderful thing! I looked to other cultures like Thailand for rice and bean noodle dishes that were to die for. Once I started to love to eat again, it was easier to thinking about trying gf things again with out feeling like I was missing out at every meal. This is the best gluten-free bread! It is oh so very close to the real thing, even in a side-by-side tasting and visual inspection. I made it for my GF mother about a week ago. However, I found out, oh, about three hours ago that I have a gluten allergy. Knowing that this bread is in the world makes the blow a little bit softer. Still difficult, but easier. I'm very glad you posted the recipe because my doctor asked me for the recipe for this amazing GF bread I was raving about, but I was reluctant to copy the recipe out of my copy of "Healthy Bread." But now I have somewhere to send them! Eek! I have this bread rising right now and I'm so excited. Had an epic struggle with my two-year-old to get her down for a nap, but then ran straight to the kitchen. yay! I made the brioche and my fam ate it all in one day! Turned out great! I even had a gluten eating baker at our bakery give it the test… it passed! great job you totally rock! bread, you say? real bread, that I can eat?! count me in! so excited to find this book and try some of these out. I'm still pretty new to the baking portion of eating gluten-free, though the cooking portion is going rather well. so far I have been opting for boxed gluten free mixes, mostly from Whole Foods, but I'm ready to try some from scratch. so excited! I've also just started my own blog and have added a link to your site! such great info here, thanks! I've learned that if you add a little potato flour (not potato starch! ), up to 1 Tablespoon in most recipes, your texture is better and your crumminess is less. You almost always need xanthan gum as well. OH MY LORD. It's bread! Really, really bread! I made a loaf on Sunday, and can I tell you, I got NOTHING done at work on Monday because I had bread on the brain all day. I've got the 2nd loaf in the oven now & your book on pre-order. I'm not much of a baker, but this recipe is so easy! I ran out of brown rice flour so I subbed 1/2c teff, 1/2c millet & 1/4c sweet rice. I have been looking for wheat/gluten free yeast breads. This is great and cannot wait to try it. I have a question though, my hubby cannot have any kind of sugar, including honey. I always wondered if yeast breads would work without the sugars. Could I just leave the honey out? My 11 year old daughter was diagnosed a year ago with gluten intolerance, as well as dairy, egg and casine allergies. The biggest thing that we learned was that eating gluten free CAN be done, and done easily. When you first find out about it, it's so completely overwhelming. As you start reading labels, you find out how many items have gluten in them, that you never suspected would contain gluten. I have made many garbage-worthy attempts (some even the dog wouldn't eat!) but have also had some amazing successes. I do spend a lot of time cooking and baking for my family. Since we can't use eggs either, most pre-made items are out as well. 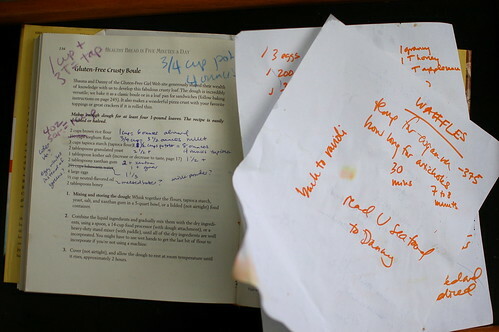 I have also learned that you should write down what you put into a recipe, as you're doing it, so that you can recreate it. I tend to be a "what do I have in the fridge to throw into this recipe" kind of cook (sometimes good, sometimes bad!) But it's hard to recreate a success if you aren't sure what your measurements were. Thank you for continuing to inspire good GF cooking! i have these in the oven now and they smell unbelievable. is there any reason why i couldn't make this as one large loaf and just adjust the baking time a little? thank you. This is the most incredible bread! I cannot get over how crunchy and flavorful it is! It reminds me of the rosemary focaccia we used to eat as kids at our local italian restaurant. Mmmm! I made this tonight while my husband is away on a business trip, and it is not good to be left alone with freshly baked bread! I fear I will eat the entire loaf! Shauna, I got your newest book for Christmas and wanted to make the “crusty bread that even those who eat gluten might like”, but I cannot find millet flour and don’t have a scale yet for substitutions. Do you have any recommendations for brands of millet flour? And, does one have to buy it online or is it normally available in Whole Foods or another large health food store? Thanks for this life-changing bread recipe! I can’t wait to make the other one when I find some millet flour! I was hoping you would have the ingredients in weight. I looked at the recipe for boule at their website and got weight measurements. I weighed everything but then put in the dry measure. The weighted amount was greater in volume so I went with the dry measure. The dough seems too wet. What I would like to know is when it is too wet what should I add? In this case I added a little bit more of the flours. It’s rising now so I’ll see how it turns out. If I was working with wheat and the dough was wet or too dry I know what to do but not sure with GF baking. Look forward to your answer. Can I just say how much I enjoy – no LOVE – all the time and attention and yeah the love that you put into all your food. I am so thrilled that someone who has a clue in the first place about baking is able to wade through all the scary and produce recipes that I (as a relative non-baker) can replicate and EAT. Oh to have bread that doesn’t taste like dust in my house again – granted it has not been long, but oh I have been craving something good lately. Thank you! Thank you! The first attempt was edible to a yummy degree. I cannot wait until the third or even the fourth try when I learn the right moments to do things; when I can adjust for perhaps that it hasn’t risen enough, or maybe know when it is getting out of hand. I never thought I would be a baker, ever, but knowing that I have not been happy with what I have found in the stores, I realized that I would *have* to bake if I ever wanted to enjoy my bread again. THANK YOU again! Has anyone figured out how to make the YUMMY crusty boule using PRE-MIXED gluten-free flour? I am needing some simplicity! Thanks so much! I made the dough tonight and will bake off the bread tomorrow. I’m just wondering if you can tell me why the difference between your recipe and Jeff and Zoe’s recipe in the preparation and baking temperature. Their recipe has you mix dry ingredients in a plastic lidded container, add the eggs, then add the other liquid 1/3 at a time. The rise and storage is all in the same container, which I find very convenient. I’m wondering why yours is different. Then, they say bake at 500 with the dutch oven lid on part of the time – yours is 450 no lid. Just curious about the differences. Thanks so much! This bread looks fabulous. I can’t wait to bake it and try it tomorrow. I’ve been making this almost daily for the last few weeks. I can’t get enough of it. Incredibly delicious. My gluten girl loves it too. Variations are easy: molasses instead of honey, adding a couple of tablespoons of ground flax seeds, doubling the rosemary. It’s hard to mess this up. We also ended up buying a copy of Healthy Bread in Five Minutes a Day to try other recipes but so far, I’ve been sticking with this winner. btw, I don’t have a dutch oven nor do I seem to need one (for this at least). I just put the boule on a sheet of parchment paper on top of a cookie sheet and pop it in the oven. I have been gluten free for five years. I am always looking for great new recipes for bread. I am so glad that I happened on your site. Fabulous bread! Thanks! I know this post is old and archived, but i just had to let you know what a FANTASTIC help this was! I have been trying relentlessly to make a decent gluten-free bread (ie: one that actually rises, tastes like bread, and doesn’t look like a lump of concrete) for months now and I think you’ve finally showed me how. This is so delicious and I’ll definitely be making it a lot! Your recipe looks great but I heard the interview on KUOW and you mentioned something about getting away from Xanthan gum, etc. How does that play in? My husband has a big problem with it. Thanks for any ideas. Hey there! If you search for whole-grain bread here, you’ll see the updated version without any gums. Thank you! Thank you! Thank you! We found out that my daughter has a wheat allergy (and more food allergies too) when she was 9 months old. I had to eliminate wheat and other things too from my diet, since I was nursing her. I had no idea how I was going to accomplish this. We now know that through me having to eliminate wheat and barley from my diet, I am gluten intolerant. It has been a struggle to find bread that I like. Pre-gluten-free days, I made sourdough wheat bread every week, cakes, cookies, cinnamon rolls, biscotti, and so much more. I now have rice bread that I can buy from the grocery store, but it just doesn’t cut it for me. I love that fresh bread out of the oven, providing for my family with fresh baked bread, and just that homey feeling that one gets with freshly baked bread. Wow! You have done it! This bread it absolutely wonderful! It looks like it has gluten in it! It has wonderful flavor! Wow! It’s like I ate gluten bread…just without the sudden sleepiness, fogginess, headaches and paranoia that comes with it! Thank you so much for all of the information you post! I have learned so much from you! Thank you!!!! I made this bread recently and it WAS wonderful. I was a little “disappointed” I guess that the loaf was so small, although in the end it only is good for so many days-on day four it started to crumble in sandwich use- My question is, though, that your picture above of the original loaf looks like it is baked in a bread pan…”sandwich bread’ shaped. What is the secret? In making the “boule” shape, the first cuts are too small for sandwiches. This “problem” is eliminated if the loaf is baked in a bread pan. Help!! I do not have Celiac, and to be honest no one in our family does. My 4 year old daughter has Crohns and we thought switching to a Gluten free diet would help her. I made this bread yesterday, with the anticpation that it would turn out nice and crusty! I LOVE this bread! It was full of flavour, the texture was unbelievable and I will make this weekly in our home! Hi can you tell me what sorghum flour is? can you also tell me how to convert the cups to grammes, when i try and use a cup my recipes turn out awful. Also I am now a big fan of buckwheat flour, just mix with water they make superb 1 minute crepes. Delicisious with olive oil and strawberry jam! Anna, there are many things she might have eaten — or encountered in her environment — of the course of that day. She might be allergic to sorghum or tapioca, but I haven’t heard of it before. Xanthan gum might affect the digestion. Also, if you look at our later recipes, we use grams instead of cups. You can substitute flours you know she can eat for those by weight. That recipe looks wonderful, cant wait to try it. My son Troy was diagnosed with adhd about a year and a half ago. We spent 6 months trying supplements, some worked wonders others didnt do too much. About a year ago we put him on a gluten free casein free diet and we have had wonderful results! Hi Shauna, you said that you can make sandwich bread with the Crusty Boule recipe. What technique should I use and how long and at what temperature should I cook it? Not sure if you found the answer Pam, but I have the Healthy Artisan Bread cookbook, and you make sandwich bread by simply putting your boule dough into a loaf shaped pan, letting it rise and then baking. I hope that the blog owners will happen upon my post and answer my question. I have read from other gf bloggers that Tapioca starch(flour) can leave a bitter taste in breads. Has anyone found that so in these recipes? I have also read that Arrowroot powder could be used as a 1 to 1 replacement for Tapioca. Since you all are the ones with experience and I am quite new to GF baking, I’m wondering if you’ve ever tried that, or if in your opinion that should work fine? I used to make the Artisan in 5 boule from their first cookbook and ADORED it, we desperately miss that type of bread around here. My son was diagnosed Gluten Intolerant last year, and I wheat intolerant. I picked up Healthy Artisan Bread in 5 today, and can’t wait to try the recipes, but I am concerned about an off taste from the Tapioca. Hope to see an answer soon. Thank you for a great website! Kate, some people detect a metallic taste to tapioca flour and some do not! I began my gluten-free cooking two months ago for health reasons. I was so surprised to find that gluten breads are denser, chewier, and actually taste healthy. Plus I’ve learned to not freak out over recipes. I use a Cuisinart breadbaker with a Gluten-Free setting and usually toss in lots of extras just to see how it tastes. 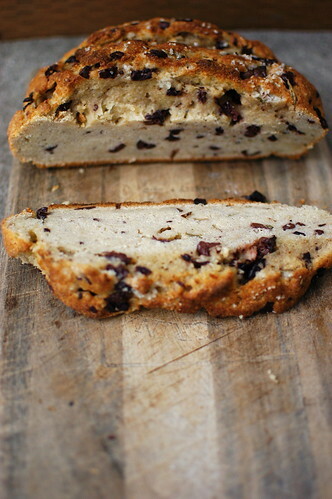 My last loaf of bread had cinnamon, nutmeg, sliced almonds and raisins….YUM. I’m going to try this cheddar sesame bread to go with dinner tomorrow. Oh, and a f.r.e.e. copy of that recipe book would be so LOV-ER-LY. Please? The second I saw this photo of the bread in this post and that it features rosemary it was love at first sight!! I made this last night and the bread is to die for! Not only is this my first adventure into gluten free baking, this was my first time ever baking bread. My crust did not turn out quite as crusty as yours in the photo, and it was a little more squat but I chalk it up to the beauty of cooking… no two are exactly alike 🙂 Thank you so very much for sharing this recipe, I have a new found faith in gluten free bread! This will forever be a staple in my house from here on out. I am not Gluten intolerant or anything like it, but am interested in recipes that work, as I am giving a few classes locally, and there are many with Celiac’s here. I am interested in cooking and baking and learned early on that “made from scratch” is always better. I make bread regularly, but have not attempted a gluten free loaf yet. I believe this will be my first to try. I love this website. I just found it, looking for a recipe for biscuits (GF), and ended up looking at everything else first. You are an inspiration. I have been reading since 10 o’clock this AM, and it is almost 2 PM! I read of your falling in love, receiving the red boots, and the woman who lost her nearly-husband on 9/11, and finding love again. I have laughed out loud, cried, sobbed, and rejoiced while reading this blog, and I thank you for being out there! Just amazing! I just made this, it’s fresh out of the oven and it’s absolutely delicious. Loved how easy the recipe was. I just finished making this bread. I used rosemary, but no olives. I made 1/2 of the dough into bread this morning and it is a tiny loaf. That said, it is DELICIOUS! The instructions on how toget the dough into the very hot dutch oven were sketchy in this recipe, to say the least, but I have been making bread in my ditch oven for over a year, and improvised, by dusting a plastic cutting board heavily with Ahern’s GF flour blend, and set the dough to rise and warm on that, then slid it into the hot pan, when it was time. It worked. I did not make slices into the top of the dough beforehand. The smell of the rosemary is just heavenly! Thanks so much! Now I can pass along this recipe to others here in town. Quick question: I just made this bread and the taste is very good but it’s flat as a pancake. I think my yeast is okay; it was bubbling with the sweetener. The dough itself was just like cake batter, even after the time spent in the warm area “rising” it was still rather soupy. The only changes I made were omitting the olives/rosemary and using your flax/chia slurry in place of the Xanthum Gum. Do you think that would have done it? I’m hoping to make a good GF bread and would love to get this one to be IT! This is AMAZING!!! The first gluten free bread that was incredible – not pretty good, or good for gluten free. THANK YOU SO MUCH!!!! Hi, I don’t have a Dutch Oven or a pizza stone. Is there any sort of makeshift thing I can do? I’d LOVE to make this. This bread was AMAZING! Light and soft on the inside, crunchy crust – it was wonderful. Tonight I’m making a variation with crushed garlic, rosemary, and thyme, and I’m going to put lemon infused oil on it before baking. It’s truly a fantastic recipe! Hi. I am searching for sorghum flour. Can I substitute another flour for the sorghum? Wow I just made this bread and it was amazing…better than any tradition bread I have ever made.